Objective To undertake a cost analysis of training medical scribes in an ED. Methods This was a pilot, observational, single-centre study at Cabrini ED, Melbourne, Australia, studying the costs of initiating a scribe programme from the perspective of the hospital and Australian Health sector. Recruitment and training occurred between August 2015 and February 2016 and comprised of a prework course (1 month), prework training sessions and clinical training shifts for scribe trainees (2–4 months, one shift per week) who were trained by emergency physicians. Costs of start-up, recruitment, administration, preclinical training, clinical training shifts and productivity changes for trainers were calculated. Results 10 trainees were recruited to the prework course, 9 finished, 6 were offered clinical training after simulation assessment, 5 achieved competency. Scribes required clinical training ranging from 68 to 118 hours to become competent after initial classroom training. Medical students (2) required 7 shifts to become competent, premedical students (3) 8–16 shifts, while a trainee from an alternative background did not achieve competency. Based on a scribe salary of US$15.91/hour (including 25% on-costs) plus shift loadings, costs were: recruitment and start-up US$3111, education US$1257, administration US$866 and clinical shift costs US$1137 (overall cost US$6317 per competent scribe). Physicians who trained the clinical trainee scribes during shifts did not lose productivity. Conclusions Training scribes outside the USA is feasible using an on-line training course and local physicians. It makes economic sense to hire individuals who can work over a long period of time to recoup training costs. With the growing use of the electronic medical record, medical scribes are becoming more prevalent, particularly in the USA. Previous studies estimate clinical productivity gains of 13%–20%, with encouraging steady-state cost–benefit analyses using medical scribes. There are no studies to date evaluating the cost of training a medical scribe making existing cost–benefit analyses incomplete. We established a scribe-training programme for an ED using on-line training materials, simulation and clinical shifts with emergency physician trainers. We demonstrate that training a scribe outside the USA is feasible; start-up costs for recruitment, on-line training, equipment, simulation and training shifts with Emergency Physician trainers were US$ 6317, Great Britain pounds (GBP) 4462, $A9202 per competent scribe. Medical scribes are an emerging role in healthcare. A trained scribe attends consultations with a physician, writing a comprehensive medical record in real time and entering it onto the patients' medical record. He/she also facilitates test ordering; gathers information; records test result interpretations; prints certificates and arranges clinic appointments. Scribe employment is rapidly expanding in North America and elsewhere, and some economic literature supports scribe use.1–8 However, these studies mainly consider cost–benefit analyses for trained scribes. Trained scribes are expected to function with the vocabulary and documentation skills of a medical resident. They are also expected to maintain professionalism, confidentiality, communication skills and safety (eg, skilful hand-washing). A trainee scribe usually starts at the level of a high school graduate, with some undergraduate science knowledge. Skills take time and money to acquire. Trainee scribes undertake a prework course; require clinical trainee shifts (supervised by a trainer) and ongoing tutorials. Emergency physicians are the most expensive resource in an ED. Forty-eight per cent9 of their time is spent on data entry into electronic medical records (EMRs). Attendances in Australia are rising at 5.5% per annum, and funding is not keeping pace. We are evaluating whether scribes might assist doctors with data entry, allowing doctors to see more patients in a cost-effective way. To our knowledge, there has been no evaluation of the costs of training medical scribes, and so the real cost of hiring a scribe remains unknown. Without this information, cost–benefit and cost-effectiveness analyses, taking into account cost offsets and productivity gains, are not possible. The primary objective of this study was to evaluate the costs of training medical scribes in an ED. This was a pilot, descriptive study of the total cost of training a scribe. Scribe training consisted of unpaid preclinical study (a blended e-learning and textbook course9), unpaid attendance at a simulation centre (including assessment and training in documentation skills), paid orientation (hospital, ED and EMR systems) and paid supervised clinical trainee shifts supplemented by textbook and on-line tutorials (unpaid). Emergency physician trainers supervised scribes during their clinical training shifts, but were not paid additionally. The study was undertaken at Cabrini Hospital ED, a tertiary, not-for-profit, Catholic private hospital in Melbourne, Australia. Seven per cent of ED presentations in Australia are to private EDs. These require patients to pay a fee. Cabrini has 832 beds; the ED has 24 000 annual attendances (adult and paediatric, mean age 56). There are 15 emergency physicians, 6 non-specialist doctors and 6 senior trainees (who are within a few months of fellowship) in the group. There is very little trainee or flow supervision required of the consultant, who provides direct patient care. Cabrini ED specialises in complex tertiary medical care. Many patients visit their general practitioner (GP) first and are referred to hospital for admission via the ED. The hospital sees mainly older Australians; many are from residential aged care facilities and the admission rate is 50%. Typical admissions from the ED require completion of complex investigations and medication charts, consultations with several specialists and end-of-life treatment limit discussions with the patient's family. Preliminary investigations were made regarding training scribes. We chose to pursue the lowest cost option, which was on-line training supplemented by a textbook, followed by clinical training using our own physicians (usually senior scribes train new candidates). We used the Medical Scribe Training Solutions10 course. Setting up to train scribes involved purchasing computers-on-wheels and a training programme, as well as writing supplemental tutorials. It also required role establishment at the hospital. The scribe candidates were the first this centre has trained. They were recruited in August 2015. The candidates were selected after the scribe role was advertised nationally and at Monash University and the University of Melbourne via university websites. We sought strong academic success, premedical studies in health sciences, a strong interest in a medical career, professionalism, maturity, confidentiality, ability to multitask, strong communication skills, self-motivation, ability to work in a team, computing skills/typing ability and the ability to manage study and work commitments (one shift per week as a scribe). Trainees were asked to commit to continuous professional development. Postgraduate medical students during clinical years of study should offer the most pre-acquired knowledge and health behavioural skills, but will only work for a year or two before graduating. Premedical students with varying years of undergraduate experience should be highly motivated and have some prelearning; they may stay performing their role for up to 5 years until graduating from medical school, allowing costs of training to be recouped. Alternate background candidates could engage in scribe work as a full-time career, minimising the training cost-to-benefit ratio. Such candidates would be most useful in rural and regional Australia where medical students and premedical student hiring pools may not be available. Candidates were enrolled in a prework-blended training programme with an on-line e-learning course and textbook. Candidates completed this at home over a month (training time was unpaid) in September 2015. They then attended an unpaid, simulation centre assessment and training day, which was used to select the best candidates to proceed to clinical training. Successful candidates proceeded to (paid) orientation to the ED and hospital in October 2015; one (paid) clinical training shift per week, with an emergency physician, and undertook on-line tutorials at home (unpaid) to fill training gaps. Training ended in February 2016. Scribe students who were not medical students required additional vocabulary training after their course. The Oxford Handbook of Clinical Medicine 9th edition11 was chosen. The trainees also required five other specific tutorials (on Australian investigations, ECG reporting, chest pain, billing and trauma), which were constructed locally. No costs are reported for these, as they use existing e-learning platforms at Cabrini, and scribe time was not paid. Scribe trainers were emergency physicians who had previously worked with scribes, but none had trained scribes. In more mature scribe systems, the scribe trainers are experienced, and the trainee scribe observes senior, experienced scribes. Competency of the scribe trainee was measured at the completion of each shift by a scribe performance scale assessment. Training ceased when the scribe achieved clinical competency. (Reliable competency was verified after this by two further sequential shift evaluations; if they were not reliably competent, more training shifts were undertaken until reliable competence was demonstrated; the verification shifts were not included in the analysis). An emergency physician was the overall programme administrator. We appointed a head scribe as our day-to-day operations manager who undertook writing rosters, approving leave, managing sick calls from physicians and scribes and addressing information technology (IT) issues. They were paid at a standard scribe rate, and all administrative hours were included in the study. Costs were from the perspective of Cabrini Hospital (Australian healthcare system, scribe programme administrator). Recruitment costs: Labour (review CVs, short-list applicants, interview candidates, follow-up phone calls); generation and purchasing of advertising. Start-up costs: Capital purchases, including computers-on-wheels and uniforms. Training materials/courses—prework and during initial clinical training at work costs: Prework course; post-initial training textbook; trainer salaries during education sessions. Administration costs for scribe training programme: Rostering, day-to-day operations (emergency physician and head scribe salaries). Scribe salaries during clinical trainee period: Costs calculated from roster databases. Clinical trainer costs: Trainers undertook their usual clinical shifts and usual patient workload during scribe training shifts. Productivity was taken to be patients per hour per doctor. The trainer productivity with and without trainee scribes was compared during the same time period. The difference between the two was then converted to a dollar cost amount based on the salary of the physician. For example, if a 10% change in productivity per hour were achieved, this loss or gain was 10% of the trainer’s salary per hour. Productivity was calculated using the following hospital databases: rostering (Kronos), patient EMRs patient administrative systems (PAS), patient billing. Productivity measurement for the doctors was felt to be accurate and a reasonable way of measuring consultant activity. Bills are generated for the doctor after each consultation, and activity can be tracked. Non-clinical time was not included in the study. All shifts were included other than night shifts. Trainee attrition: All costs were included in final analyses including costs incurred to train unsuccessful trainees. The study also collected information on harms/adverse events resulting from having trainees present during consultations to determine the costs of these to the institution. Labour costs are typical salaries for each role in Australia, including oncosts (pension contributions/leave/injury insurance) of 25%. We report the scribe wage we established based on Australian role comparisons and potential career benefits for scribes. Costs of recruitment, initial training and scribe wages during on-the-job training are presented descriptively. Trainers' productivity was measured as patients per hour. Productivity was compared between shifts with and without a trainee scribe. Due to the small sample size, formal comparisons were not made; so, a simple comparison with 95% CIs was used. The number of scribes hired was the maximum afforded by the available research funding. The number of shifts for examination was generated by the time required for each scribe to become competent. (Ethics approval: Cabrini Institute HREC 06-27-07-15; prospective trial registration ACTRN 12615000607572). We received research funding enough for 10 prework training places and six scribed medical shifts per week. Application for this role was competitive (figure 1). Progression of scribe candidates through recruitment and training. There were 79 applicants, 22 interviews, 10 enrolled for training and 9 attended the simulation day. The final six scribe trainees consisted of two medical students, three premedical students and one ‘other’ background scribe (an ED clerk). There were three male and three female clinical trainees (see table 2). They worked one shift per week each until competent (range 7–16 shifts). The base salary for the scribe was US$15.91 (including 25% oncosts, not including shift loadings). There are 130% shift loadings for shifts ending later than 18:00 hours and 150% loadings for weekend shifts. No night shifts were undertaken (due to pay loadings in Australia beyond the research budget). There were eight trainers; one contributed 53% of trainer shifts, another 21%, the rest all <10%. Seven trainers were specialist emergency physicians; a trainee registrar supervised two shifts (see table 1). The physicians who trained the scribes were from two groups—regular trainers (two physicians) or stand-in trainers (six trainers) who assisted when there were roster capacity issues or trainer on leave. Sometimes, two scribes were allocated simultaneously to one trainer physician—scribes attended every second patient encounter (this reduced the number of physician hours required for training). Salaries for staff including 25% oncosts were as follows: physicians US$129.81/hour, head scribe US$15.91/hour, EMR trainer US$25.62/hour, office support US$32.50/hour. There was complete information for 100% of shifts worked; all shifts were included. There was complete information for all training costs. Overall costs are reported in table 1. A breakdown of costs by phase of the programme can be found in the on-line appendices: supplementary table S1: Recruitment and start-up; on-line supplementary table S2 Initial on-line training and assessment; on-line supplementary table S3: Cost of administering clinical training programme over 16 weeks; on-line supplementary table S4: Clinical training—Scribe and physician salary costs). Physician productivity (measured in patients per hour) increased from 0.86 to 0.89, or a 4% increase in productivity per hour. The overall gain per hour of the physician trainer during scribe clinical training was US$5.19/hour in terms of physician salary (table 2). The background of scribes, compared with their progress and costs through the training programme, is reported in on-line supplementary table S5. There were no harms to patients identified during this programme. The main findings were a start-up time of 7 months (excluding initial stakeholder buy-in time), 79 applicants, 6 clinical trainees and 5 competent scribes. The total cost of the initial scribe programme was US$31 853, including equipment and start-up education tools. The productivity of physician trainers was essentially unaffected while training scribes. This is the first study, to our knowledge, specifically testing and reporting the costs of training scribes. It is the first description of a training model outside the USA. It is also the first study to test the capabilities of the trainee scribes after each shift to determine how long it takes to train a scribe. One study has included estimates of training costs; however this did not include start-up equipment, recruitment, training materials, evaluations of competency or costs of trainers or administration.6 Most cost–benefit analyses of scribes have presumed that the scribe is trained and experienced. These analyses estimate 13%–20% medical productivity gains,1 ,5 ,8 ,13 with overall economic gains based on more patients and increased revenue per patient (in the USA, not Australia) set against salary costs of the scribes. Our study demonstrates that it is feasible for the hiring institution to train scribes. The total costs of start-up and training were US$6317 per competent scribe. Australian scribe wages per hour (inclusive of 25% oncosts) were US$15.91 ($A22.98) per hour plus shift loadings. How these costs are recouped will depend on the number of shifts undertaken by each trained scribe. It would make economic sense to recruit staff who can work more than one shift per week for a long period of time (several years). Target employees for our department in future will be academically excellent premedical students, perhaps with prior health work experience, or junior medical students with a clear motivation for requiring ongoing part-time employment. Once trained, keeping these employees motivated and engaged is important given the costs involved in getting them to this point. This was a new scribe training programme outside the USA. The methods were chosen to reflect this. It offers a model for other institutions that have not already established a scribe programme and that are considering training options and costs. Other facilities may not have compulsory requirements for modular training for all new staff, such as hand washing, fire training and hospital orientation. Others may own enough computers already; so, some costs may be reduced. Hiring only premedical students and medical students may have increased the chance of clinical trainee success and hence reduced costs; however, strong conclusions are not possible with only one trainee from a non-medical background. The overall benefit/loss from training five scribes at the institution was a loss of US$31 583. The benefits of having these trained scribes in our ED are still being evaluated. Physician productivity during training was neutral. The hospital providing clinical training placements should not anticipate productivity losses from their physicians while training scribes. 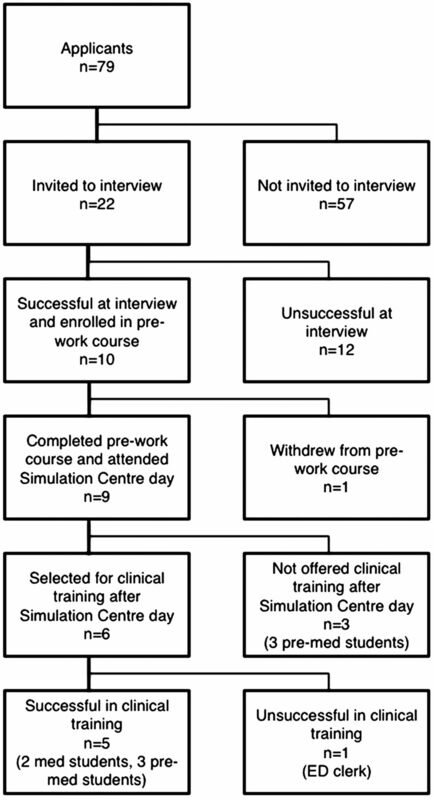 This was a single-centre, small pilot study in a centre without established scribe training expertise and processes. The study was coincidentally conducted during the lowest patient attendances at the study ED for many years. There were many hours in the study where the physicians were not fully occupied with patient care. Interpretation of productivity data is challenging in this setting. Productivity of doctors in Australia is largely uninvestigated. The consultation rate at Cabrini of 0.86 patients/hour/doctor and 50% admission rate compares similarly with other private EDs with geriatric populations (other EDs, personal communication, May 2016). For future training at the same centre, start-up costs would be lower as equipment would already be on-site. Further work should evaluate alternative models of training for cost effectiveness. It should also investigate whether scribes can contribute more to their training costs, as do most other professional groups in health (eg, developing external scribe training courses). Training scribes outside the USA is feasible. The overall cost per competent scribe was US$6371. The total cost of training five scribes was US$31 853. Scribes required 68–118 hours of clinical training after their initial course to become competent. Physicians can train scribes without losing productivity. The authors thank Cabrini and the Cabrini Foundation for their support and the many individuals who supported this study.
. The Ultimate Medical Scribe Handbook: Emergency Department 4th edition+online e-learning course 2014: createspace, 2014. http://www.medicalscribetraining.net/emergency-department-scribe-course.html (accessed Mar 2016).
. Oxford handbook of clinical medicine. 9th revised edn. Oxford University Press, 2014. Organisation for Economic Co-operation and Development, Purchasing Power Parities and exchange rates. https://stats.oecd.org/Index.aspx?DataSetCode=SNA_TABLE4 (accessed Mar 2016).
. Implementation of medical scribes in an academic emergency department: effect on throughput, clinical productivity, and emergency physician professional fees. Acad Emerg Med 2012;60:S105. Contributors KJW is guarantor for the paper. Funding: KJW and MB-M; Methods design: KJW, MJ, DL and DP; Statistical methods: MJ and WD; Data collection: KJW, WD, DP and IT; Education development: KJW, MJ and IT; IT development: HGR and KJW; Write-up: KJW, WD, MPS and DL; Revision of write-up: all authors. Funding Equity trustees, the Cabrini Foundation and Cabrini funded the study. Competing interests KJW reports funding from equity trustees, Cabrini and the Cabrini Foundation, to evaluate scribe feasibility in Australia. She is the director of the scribe programme at Cabrini which has been established in a research capacity, and she has published previously in this area of research. KJW and Cabrini have no commercial interests in this topic. The grant agencies have not been involved in the research other than to provide funding.